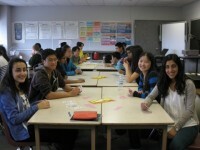 Grade 10 students are continuing their weekly Bridge lessons, taught by Mr. Shapiro. After moving on from the basics of bidding, the classes are now focused on learning how to defend a contract. A welcome break from traditional math classes, students look forward to these lessons every week! Grade 10 students are currently learning about software programming in Java. After mastering the basics of the language, they have worked on programs that display detailed images and execute various calculations, and are now in the process of developing interactive software! The new grade nine TOPS students have returned from Camp Pinecrest, having had a fun-filled three-day trip which helped them get to know each other. Some of the Algonquin trip seniors on their practice hike for the big trip in May.